Notes the legendary El Dorado. Tabula Americae Specialis Geographica Regni Peru Brasiliae, Terrae Firmae, and Reg: Amazonum. This is an extraordinary example of Homann Heirs’ magnificent c.1728 map of northern South America. It covers from Costa Rica and Barbados south roughly to the Tropic of Capricorn, or more precisely, 50 degrees south latitude. The map renders the entire region in extraordinary detail offering both topographical and political information with forest and mountains beautifully rendered in profile. Based on the work of Guillaume De L’Isle, this map, like most early maps of the area, contrasts a detailed mapping of the coast with a speculative discussion of the interior, particularly the Amazon Basin. It offers a fairly accurate mapping of both the east and west coasts with exceptional detail in the populated Andean regions of Columbia, Ecuador (Labeled Quito), and Peru. Notes Cuzco, Lima, Quito, Valladolid, Arequipa, Trujillo and other important trading centers of the region. In Portuguese controlled Brazil, Rio de Janeiro, San Salvador and San Sebastian are noted. Lake Maracaibo, in modern day Venezuela, is slightly malformed and elongated. The interior is where this map gets interesting. De L'isle was a cautious and scientific cartographer, who based his maps on the first hand reports from sailors, merchants and missionaries that, at the time, were flowing into Paris at an unprecedented rate. This map is no exception and De L'isle credits the mappings and explorations of Alonzo de Herrera, Johannes de Laet, P.P. D Acuna and M. Rodriguez. Nonetheless, the mapping of South America's interior is full of inaccuracy, curiosities, and ample fodder for the gold hunting European. 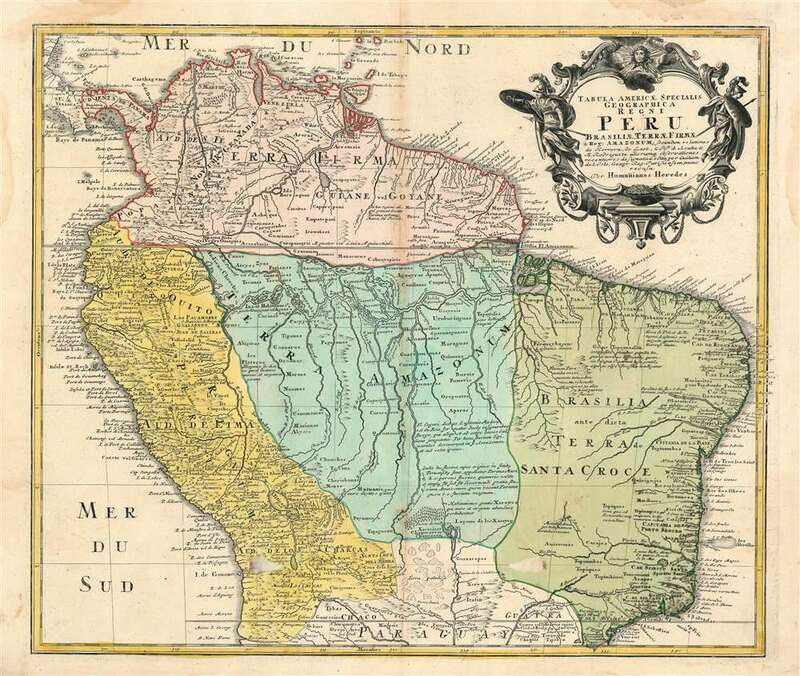 Our survey of this map begins with the impressively accurate mapping of the Amazon and Orinoco River systems - though he does erroneously connect the two, an understandable error common to maps of the period. Roughly where the Grand Sabana is today, in modern day Venezuela, the map speculates the location of Lake Parima and the city of El Dorado (curiously this is actually gold rich region though difficult to access and mine). Further south he notates numerous gold rich indigenous groups including Los Plateros and Xarayes. To the north of the 'Island of Paradise' appeared the 'Puerto de los Reyes' which was considered to be a gateway to the Amazon and the Kingdom of El Dorado. The 'Laguna' and its island are shown in a much reduced form compared to earlier cartographers. A decorative title cartouche adorns the upper right quadrant. Altogether this is a spectacular map of the region. Very good. Some wear and toning along original centerfold. Minor creasing. Verso repair along damage near centerfold. Minor foxing. Original platemark visible. Some loss on lower left and right quadrants.